The following video was produced to honor the skilled knife makers currently employed by Egginton Group in Sheffield, UK. I am pleased to post it here to illustrate that indeed, the end of an era has not happened, and the skills for which British knife makers are renowned continue to be practiced today and hopefully far into the future. Visit their website to view additional videos on the art of knife making. End of an Era? : Here is the seller's description of two unusual F~S knives. "Wilkinson F/S Knives---Lot of two----The top knife has a blade 7" long and mint. It has the Wilkinson Logo from the 70's. It has a nickel silver guard. The Ivorine handle is the same handle used on the 1947 Tom Beasley F/S knives. The scabbard has a brass throat and chape with a leather covered body." The quality of Wilkinson Sword Co. knives conspiculously dropped off (far worse than these two examples) in its closing years. Fit and finish deteriorated after its acquisition by Fiskars, up until the final closure of that branch of the company known for production of the famed British Commando Knives. Were these two knives put together by the company to use up old inventory, or did an individual worker with access to a stock of old parts? Or, were they built up by someone completely separate from Wilkinsons? Probably we will never know for sure. Either way, they intrigued me enough to purchase the set. "The lower knife has a blade 6 1/2" long. It is a Wilkinson commemorative blade from 1975 commemorating the exploits of the Commandos. It is a plated blade with some of the plating flaking off the tip area. It has a nickel silver guard. The handle is Ivorine and probably from the 40's. 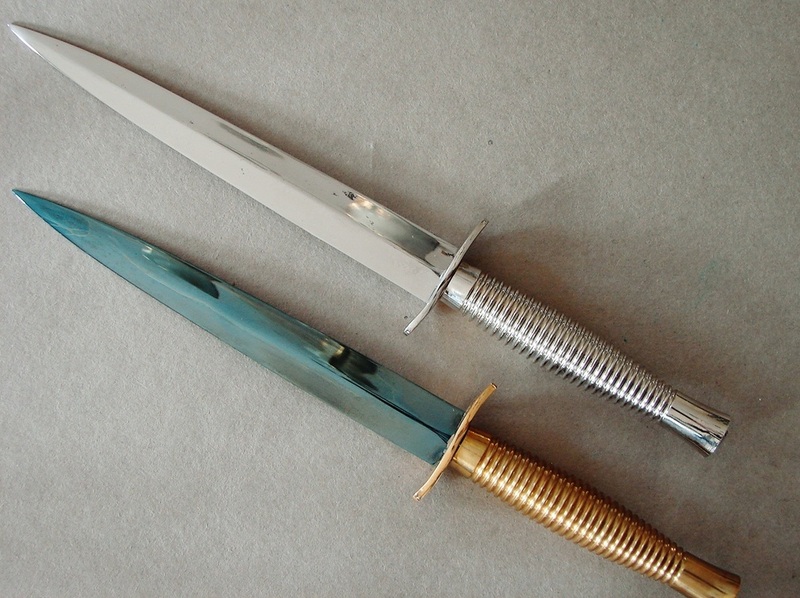 The scabbard is an original 1947 scabbard for a Tom Beasley knife. It is possible that these knives were put together and sold when Wilkinson closed." Below: Some interesting news on the final disposition of the Wilkinson Sword Co. Fairbairn-Sykes legacy. "In November 2005, WKC purchased the tooling from Wilkinson Sword Ltd. for production of various ceremonial swords, including the F+S Knife." Weyersberg, Kirschbaum, & Cie. The quality of the knives produced by this firm are equal in quality to the last of the good Wilkinsons back in the late nineteen hundreds. 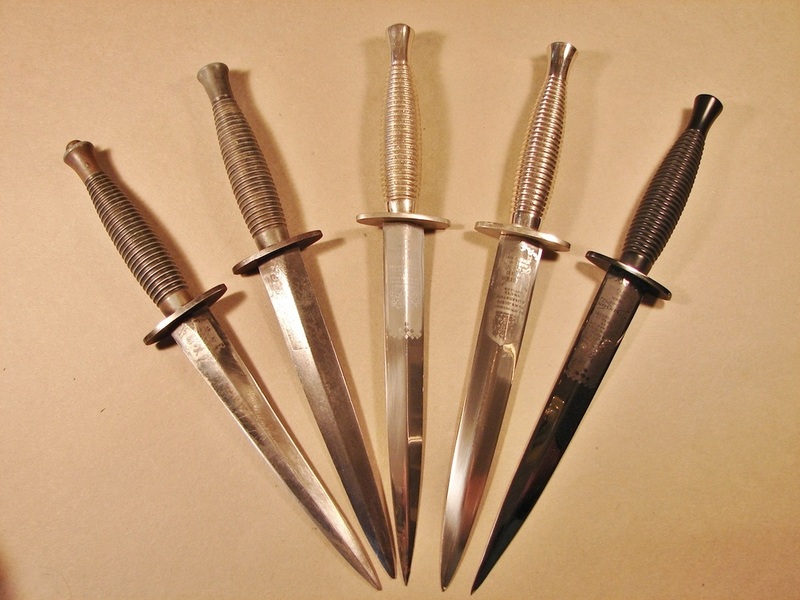 These knives are featured under our section on Post-war knives. The similarity of the WKC knives to the Wilkinson knives at the right is quite obvious, with the exception of the WKC curved guards. They are similarly dull edged. A visit to our page on modern derivations of the F-S knife will quickly convince you the genre' is as popular today as ever, both among collectors and warriors.